My family loves a comforting bowl of soup especially sweet corn based soups… We love it throughout the year. Even though we always place an order for soups when we dine at restaurants, I do prepare the restaurant style version in my very own kitchen. I make sure I am well stocked with tins of cream style sweet corn. Besides, sometimes I do make my own cream style sweet corn & use it . I also make & freeze chicken stock & vegetable stock as this comes in very handy when I want to prepare food & soup at very short notice. First dilute the corn flour in about 1/3 cup of water till smooth. In a thick bottomed pot or a non- stick pot, blend cream style corn with chicken stock & water till smooth. If using stock cubes then blend & dilute till smooth using 4 cups of water. Heat the mixture on med. flame till it comes to a rolling boil. Add in the boiled shredded/cubed chicken in the soup. Reduce heat & pour in the corn flour liquid in a thin stream while you keep stirring continuously as it thickens. Add in the sugar, pepper pwd. & salt to taste. Stir well. Now, lightly beat the egg white & gently pour it in the soup in a thin stream while you keep stirring quickly & continuously. The egg white should resemble thin ribbons in the soup. Taste to check out the seasoning. Lastly, add in the finely chopped spring onions. Give it a good stir. 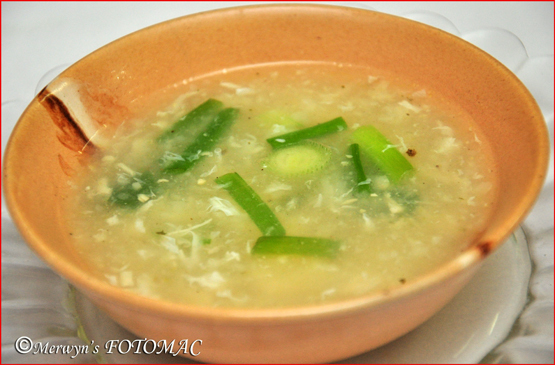 Your sweet corn chicken soup is ready to be served hot in soup bowls or soup cups. You may add soya sauce, or chilli vinegar as per your preference.